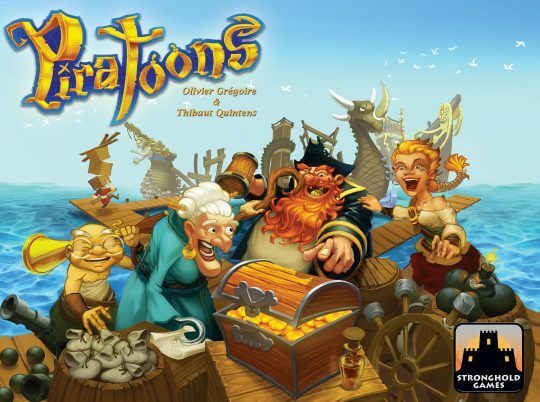 In Piratoons, each turns begins with a treasure of boat parts and equipment being revealed. All at the same time, each Pirate rushes to allocate crew in an effort to plunder the best loot by placing their crew meeples on individual items as bids. Each piece of treasure goes to the player with the most crew invested in the item, but only after removing all tied bids. Therefore, Pirates need to stay alert for sneaky opportunities to cancel out an opponent’s efforts or for chances to swoop in and steal a disputed treasure. A featured component of the game is the central loot chest formed by two double-sided boards with raised edges. Before each turn this treasure chest gets loaded with random face-down treasure, then it’s sealed, flipped, and revealed simultaneously to the eager Pirates by removing the board on top. The mad rush of plundering in real-time (there is a 15-second sand timer included) and the spatial puzzle to build the best ship possible are the key ingredients of the game’s experience.